The Portuguese coach will depart his role at Old Trafford at the end of this season. Faria pictured alongside manager Jose Mourinho. MANCHESTER UNITED ASSISTANT manager Rui Faria will depart his position at Old Trafford at the end of this season, the club have confirmed. Faria has worked as the side’s assistant for the past two years and has worked with Jose Mourinho for over 17 years, but speaking on Saturday said the timing was right to depart. “After a lot of consideration, and with a very heavy heart, I have decided the time is right for me to move on,” he said. “I have had 17 years of incredible and unforgettable experiences. However, I have felt for some time that I would like to spend much more quality time with my family before pursuing any new challenge in my professional life. #MUFC announces that assistant manager Rui Faria is to leave the club at the end of the season. We wish him all the best for the future. Mourinho acknowledged the 42-year-old’s loyalty during their time spent across Europe’s top clubs together. “17 years… in Leiria, Porto, London, Milan, Madrid, London again and Manchester. Training, playing, travelling, studying, laughing and also a few tears of happiness,” said Mourinho. “The kid is now a man. The intelligent student is now a football expert, ready for a successful career as a manager. Email “Rui Faria set to depart Man United after 17 years working alongside Mourinho”. 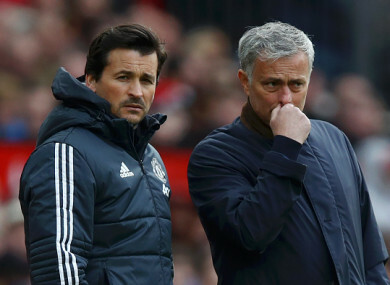 Feedback on “Rui Faria set to depart Man United after 17 years working alongside Mourinho”.